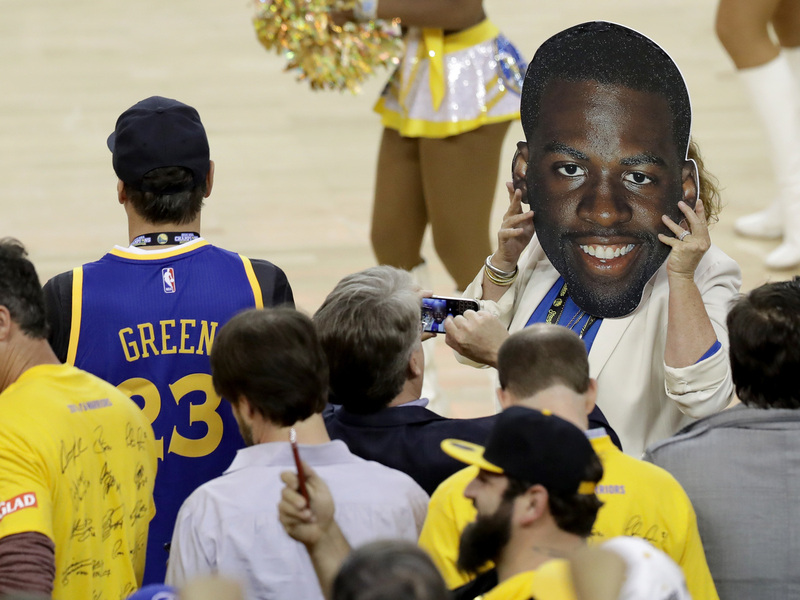 Cleveland Stays Alive In NBA Finals Against Depleted Golden State : The Two-Way With all-around star forward Draymond Green suspended and center Andrew Bogut downed by an injury in the second half, the Warriors couldn't muster the muscle to drop the Cavaliers and take the series. 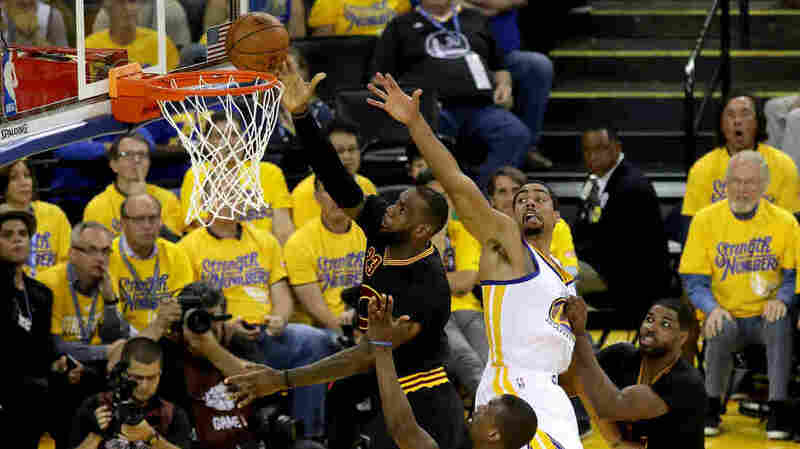 LeBron James of the Cleveland Cavaliers goes up for a shot Monday night in front of James Michael McAdoo of the Golden State Warriors in the first half in Game 5 of the 2016 NBA Finals in Oakland, Calif. Even with their best defensive player Draymond Green suspended, the Golden State Warriors were in a close fight with the Cleveland Cavaliers on Monday night in Oakland. It felt like the sort of game where one late run from guards Stephen Curry and Klay Thompson could settle Game 5 of the NBA Finals, and the entire series. 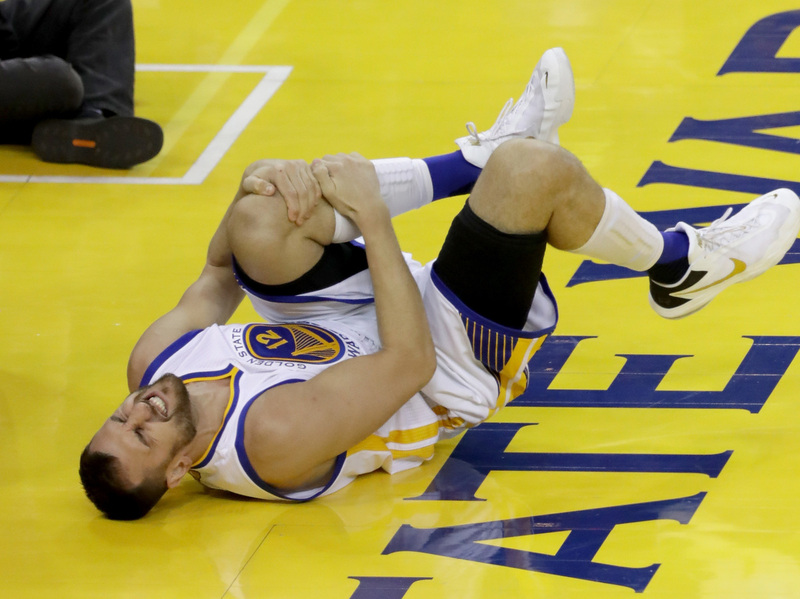 Then big Andrew Bogut toppled. 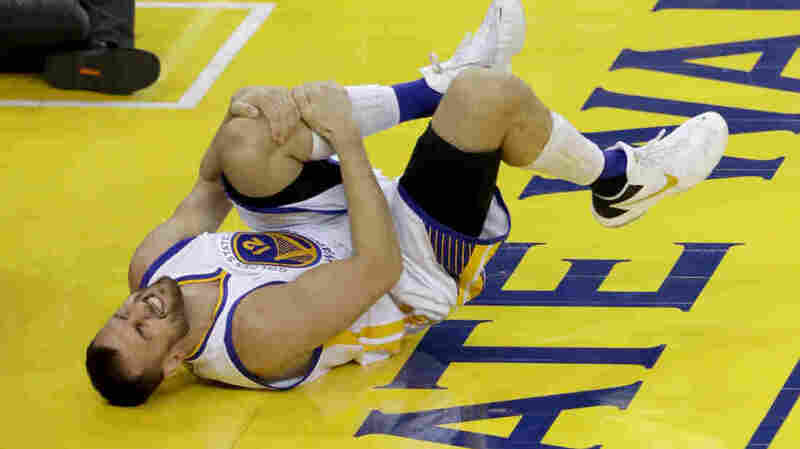 Andrew Bogut of the Golden State Warriors holds his knee in pain after sustaining an injury in the third quarter Monday night in Oakland. A Cavaliers player landed on the 7-foot center's left leg early in the second half, and Bogut immediately grabbed his knee. With both their starting big men out for the game, a close game turned into an eight-point Cavaliers lead. The Cavaliers never trailed again, and won 112-97. The Warriors lead the series three games to two. The absences clearly hurt the Warriors' defense. In the first four games of the series, the Cavaliers shot 47 percent from two-point range and 32 percent for three; those respective figures were 58 percent and 42 percent Monday night. 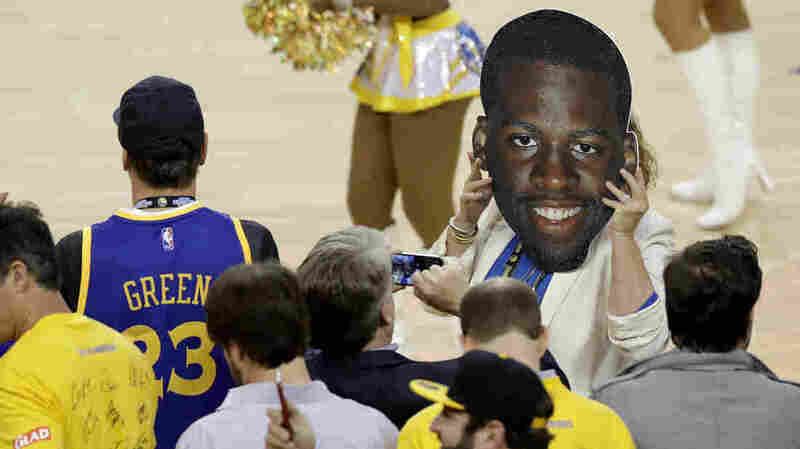 A fan holds up a cutout of Draymond Green's face Monday night. The Golden State Warriors player was suspended for Game 5 of the NBA Finals because of a flagrant foul he committed in the previous game. 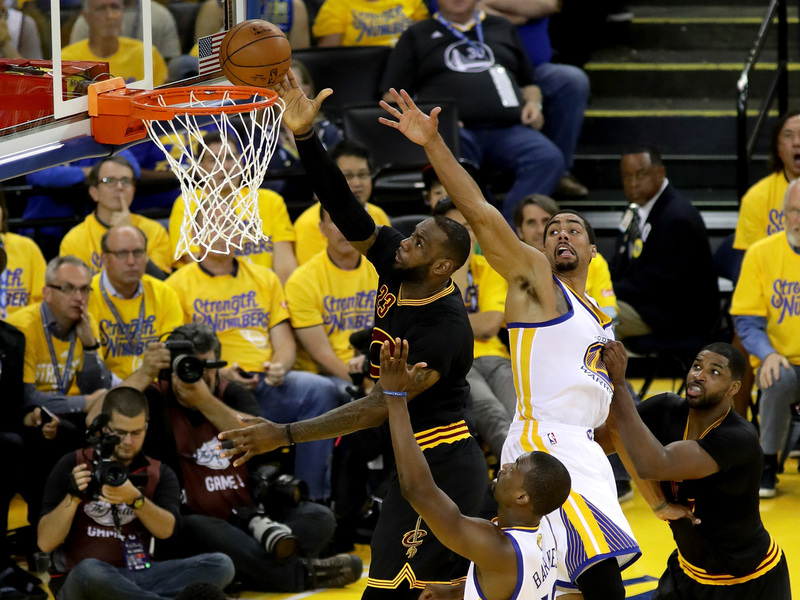 The game started as an offensive clinic; the 61-61 halftime score was the highest in the Finals in nearly 30 years. The Cavaliers were led by an outstanding shooting performance by Kyrie Irving, who had 41 points on just 24 shots, while Lebron James had the kind of Finals game only he's delivered in recent years. It was the first time in Finals history that two teammates had scored 40 in the same game. The Warriors were led by a shooting barrage from Thompson, who scored 37 points on 20 field goal attempts and nine free throws. NBA MVP Curry had 25 points but didn't shoot particularly well. Harrison Barnes, a 6-foot-8 natural small forward who at times was the Warriors' biggest player on the floor, struggled. He shot 2-14 for the game, including 0-6 in the fourth quarter. Golden State will get Green back for Game 6 at 9 p.m. ET on Thursday in Cleveland. Bogut's status is unknown.